Many of us have fantasized to be a part of the Lilliput’s world in one or the other manner. Being tiny	could be more explorative, but have you ever imagined being tinier than the Lilliputians? As if somewhat near to be the size of the microscopic organisms. Shocked, right? Come. Let us get into the world of microscopic life outright! Scientists have been inventing the microscopes (Magnifier of the image of small objects) to study the minute world of organisms from ages. This invention has taken us to an extent that the organism world is no more a wonder. The minutest is hard to escape from the human sight. A human’s body is full of extraordinary shockers. There are infinite gears into the body which can surprise us by its appearance, characteristics and task. Usually, we hardly bother to know the minutia of these parts. Let us know about these little things. 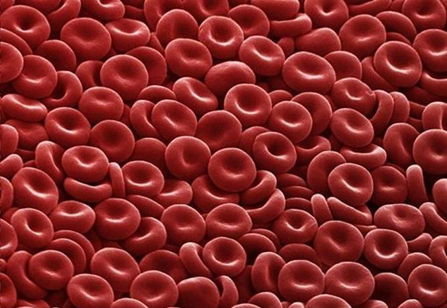 This is the image of Red Blood Cells. Scientifically known as ‘RBC’, these are mature blood cells that contain hemoglobin to carry oxygen to the bodily tissues like a biconcave disc that has no nucleus. 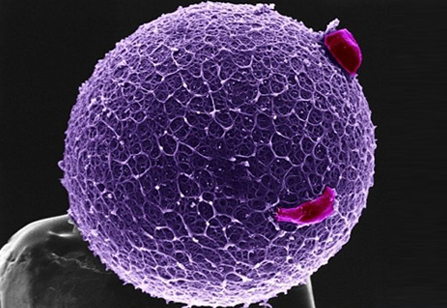 These red blood cells appear to be like tiny cinnamon candies. 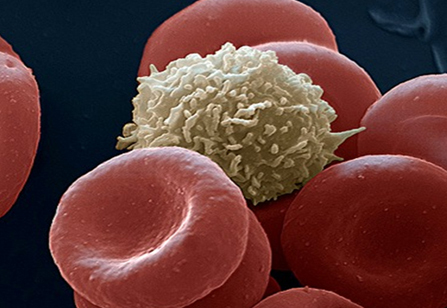 But in actual, these are one of the most common types of blood cells found in a human body. 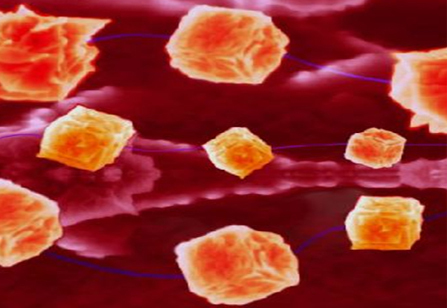 These biconcave-shaped cells perform the most eminent task of circulating oxygen into our entire body. In women, there are about 4 to 5 million RBCs per micro liter (cubic millimeter) of blood and in men it’s about 5 to 6 million per micro liter. People, who live at higher altitudes from sea-level, have even more RBCs because of the low oxygen levels in their environment. This image is of Purkinje (pronounced purr-kin-jee) Neurons. 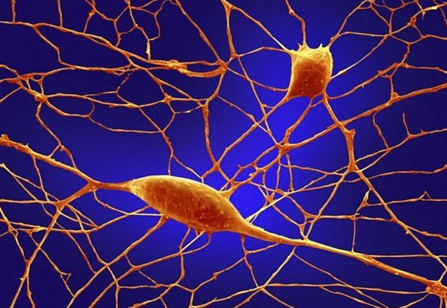 These are a large densely branching neuron which is the characteristic cell of the cerebella cortex. There are about 100 billion neurons in our brain. Purkinje neurons are some of the largest cells in our body. Among other things, these cells are the masters of motor coordination in the cerebella cortex. Toxic exposure, such as alcohol and lithium, autoimmune diseases, genetic mutations including autism and neurodegenerative diseases can negatively affect human Purkinje cells. 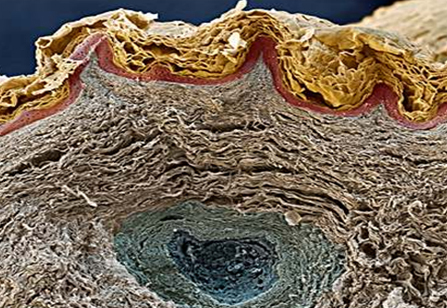 This is a close-up of Human Hair Cells stereo cilia inside the ear. Hair cell is a sensory epithelial cell present in the organ of Corti (The hearing organ of the inner ear which contains receptors that respond to sound waves). 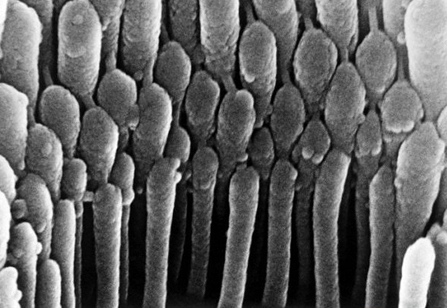 In hearing, stereo cilia transforms the mechanical energy of sound pressure into electrical signals for the hair cells, which ultimately leads to an excitation of the auditory nerve. Normally, it detects the mechanical movement in response to sound vibrations. Stereo cilia cannot be regenerated and causes deafness when damaged or destroyed by excessive loud noises, disease or toxins. This is the picture of blood clots. Blood clots are like sticky web, fibrin strands, formed by the process of coagulation (the blood’s natural tendency to clump and plug an injured blood vessel). Clots serve as a valuable contrivance in wound healing and preventing the flow of blood after an injury. Combining with blood cells, it rapidly forms a clump over the blood vessel to stop bleeding after injury. The cell in the middle is a white blood cell. This is the image of Alveoli in the Lung. Alveoli are basically a tiny sac (hollow cavities) for holding air in the lungs, formed by the terminal dilation of tiny air passageways. The Alveoli i.e. the inner surface of the lung structure is normally the same in any mammalian. 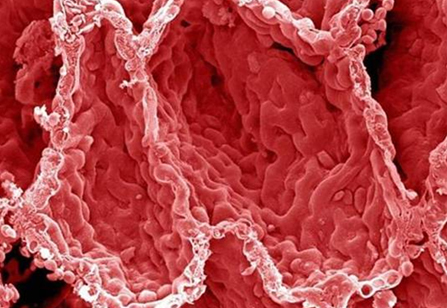 The blood brings carbon dioxide from the rest of the body, for release into the alveoli and the oxygen in the alveoli is taken up by the blood in the alveolar blood vessels, to be transported to all the cells in the body. Alveoli contain some collagen and elastic fibers. The elastic fibers allow the alveoli to stretch as they get filled with air when breathing in. They then spring back during breathing out, in order to expel the carbon dioxide. The alveolar membrane is actually the gas-exchange surface. This image is of Intestinal Villi. They are tiny, finger-like projections that come out from the wall of the small intestine, increasing the surface area of the gut. It provides exceptionally efficient absorption of nutrients in the lumen. Circulating blood then carries these nutrients away. Villi increases the absorptive area and the surface area of the intestinal wall to enhance food absorption because if the food absorbing process gets slow, it will create diffusion. Observing closely, some food stuck in one of the crevices can be seen. This image is of an immature ovum or Human Egg with Coronal Cell, normally known as an oocyte, ovocyte or rarely ocyte. It is a female gametocyte or germ cell, involved in reproduction. 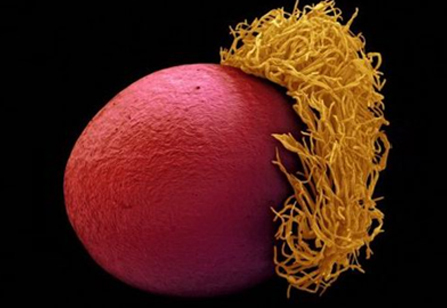 The egg is coated with the zona pellucida, a glycoprotein that protects the egg but also helps to trap and bind spermatozoa. Two coronal cells can be seen attached to the zona pellucida. 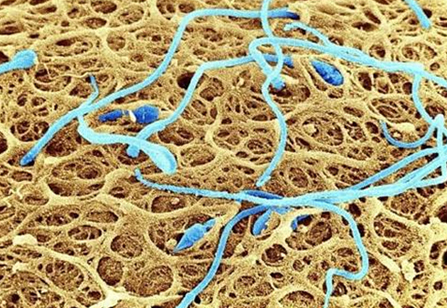 This is the image Spermatozoa on the Surface of an Oocyte (human egg cell). With the help of zona pellucid, these spermatozoids fertilize the cell and convert it into an egg, to heighten the fertilization process. 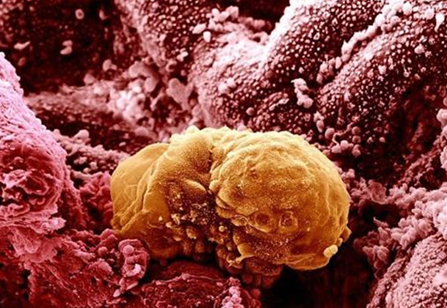 This is the image of Implanting Human Embryo after only six days of the fertilization of the oocyte with incorporating spermatozoids. After the fertilization, fertilized oocyte (the egg cell) is called ‘zygote’. The development of the embryo is called ‘embryogenesis’. It contains the half of the DNA of both parental cells. This image is of Blood Glucose. The living cell uses blood glucose as a source of energy and metabolic intermediate. It is one of the main products, responsible for cellular respiration. Failure to maintain blood glucose in the body can lead to severe ill conditions like lethargy, impaired mental functioning, irritability, shaking, weakness in arm and leg muscles, sweating, loss of consciousness, brain damage etc. Diabetes and hyperglycemia are the prominent examples of the disorders related to failure of blood sugar regulation. If blood glucose level drops too low, a potentially fatal condition called ‘hypoglycemia’ can also take place. 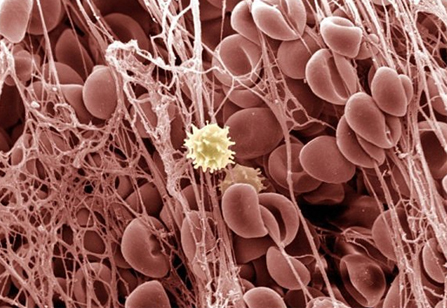 This image is of White Blood Cell lying in the middle of the red blood cells. Commonly known as WBC, is the major part of body immune system. It defends the body against both, infectious diseases and foreign materials. They are found throughout the body, including the blood and lymphatic system. This image is of the Blood Vessels from the Optic Nerve (The cranial nerve that serves the retina). Here the stained retinal blood vessels can be seen emerging from the black-colored optic disc. The optic disc is a blind spot because no light receptor cells are present in this area of the retina, from where the optic nerve and retinal blood vessels go towards the back of the eye. 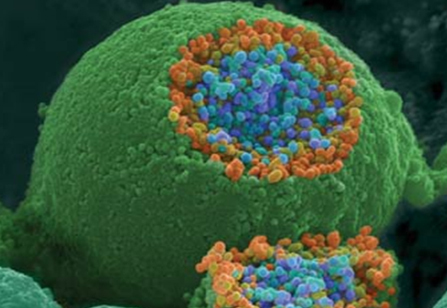 This image is of a Nerve Ending. A nerve is an enclosed, cable-like structure to provide a common pathway for the electrochemical nerve impulses and blood. It has been broken open to reveal vesicles (orange and blue) containing chemicals used to pass messages in the nervous system. This is the image of a Cancellous (spongy) Bone Tissue. Bone tissue can be either cortical (compact) or cancellous. Cortical bone usually makes up the exterior of the bone, while cancellous bone is found in the interior. 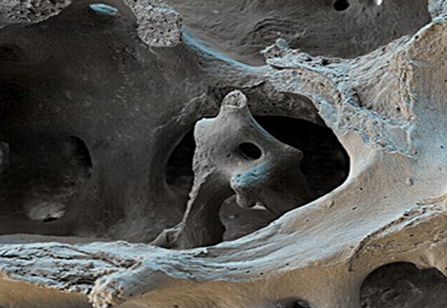 Cancellous bone is characterized by a honeycomb arrangement, comprising a network of trabeculae (rod-shaped tissue). These structures provide support and strength to the bone. The spaces within this tissue contain bone marrow. We saw the amazing internal body shots. Likewise, external parts of human body are super startling. Let us go through these shots. 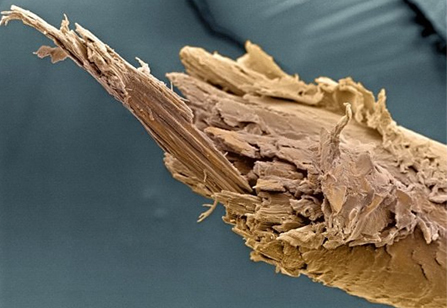 This image is of a Broken Human Hair. Hair is actually the cylindrical filament characteristically growing from the epidermis of a mammal. Hair requires the utmost care to avoid such severity. Regular trimmings and use of good conditioner should help to prevent this unsightly picture of a split end of a human hair. This picture is of Surface of a Tooth Plaque. Dental plaque is actually a biofilm (usually colorless aggregate of microorganisms) that builds up on the teeth. If not removed regularly, it can lead to dental cavities or periodontal problems. 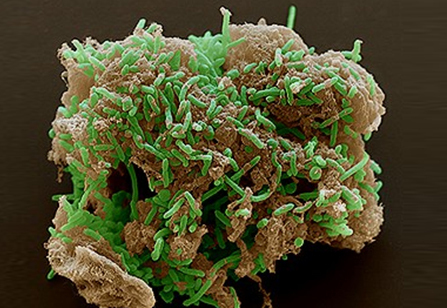 Such biofilm can get composed at various locations in the mouth. The microorganisms present in dental plaque are all naturally present in the oral cavity and are normally harmless. However, failure to remove plaque by regular tooth brushing means that they are allowed to build up in a thick layer. Therefore, brushing the teeth regularly is important. These microorganisms nearest the tooth surface start producing acids in this state, resulting tooth decay and other oral disorders. 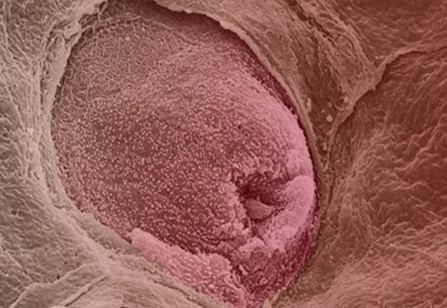 This color-enhanced image depicts a Taste Bud on the Human Tongue. An average human tongue has about 10,000 taste buds that are involved with detecting salty, sour, bitter, sweet and savory taste perceptions. The taste receptor cells send information detected by clusters of various receptors and ion channels to the gustatory areas of the brain via the seventh, ninth and tenth cranial nerves. Excess dosage of any of the five tastes can damage the taste buds temporary or permanently. Rapid tongue cleaning and appropriate oral care can aid the most. 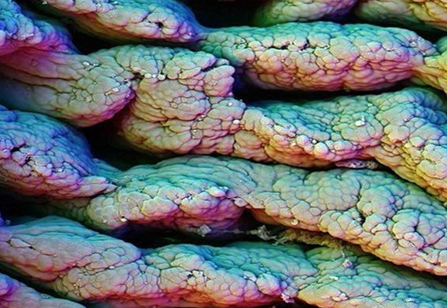 This image is of Human Skin Layers. The flattened, flaky and brown skin layers from top to bottom are composed of dead skin cells, forming the surface of the skin. The dead cells from this layer are continuously being shed and replaced by cells from the living red epidermal layer. The lowest layer (dermis), lower centre grey-brown layer supports and nourishes epidermis with fibrous connective tissues. In the middle layer, there is a sweat gland. 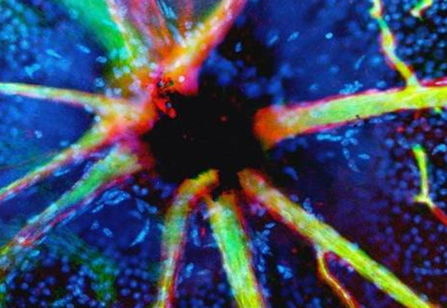 Microscopic world can make us inquisitive. This wonder is not limited up to the human body. The insect world is also found with astounding beauty of its kind. This image is of the Fly Foot. We can see the tacky hair and claws on a fly foot. It acts as hooks and filamentous pads helping to cleave the surfaces. Flies use their feet for many purposes. Large sensory hair helps to figure out the surroundings. The small hair will adhere to smooth surfaces through surface tension. 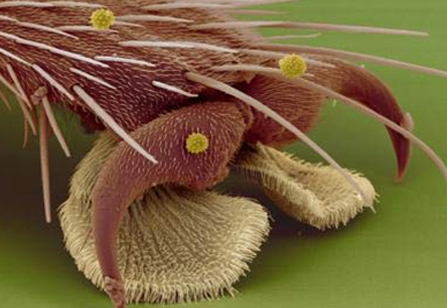 Other hairs are sensory organs, allowing flies to taste with their feet. 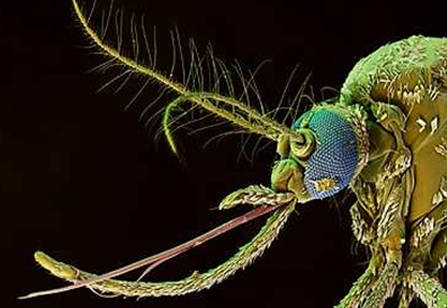 This image is of a Mosquito. A common blood-sucking insect, that spreads yellow fever, dengue and filariasis. The mosquito uses its mouthpart to pierce the skin of its victim. Only female mosquitoes carry the arbovirus, which causes yellow fever in humans. Affected patients develop a fever and the skin becomes yellow due to jaundice. 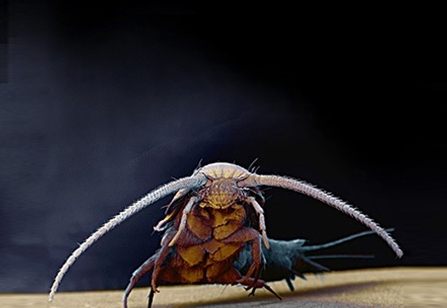 This image is of a common household pest called Silverfish. It is an extremely fast-moving, silver-grey wingless insect, with a long tapering body and three bristles at the rear. It is mainly found on old furniture, feeding on book bindings and starched clothing. It has a head with sensory hair, mouth and long antennae. As the name suggests, primarily microscopes were invented to understand the world of microorganisms. This invention has never set back and has landed with ultimate beatification. Let us see some common unicellulars. This image is of Protozoans which are easily seen under a microscope. It has a long whip-like tails called ‘flagellum’ (a thread-like structure), used for locomotion. They play a key role in maintaining the balance of the ecosystem. Protozoans are found in over 30,000 different types. It exists throughout aqueous environments and soil, occupying a range of trophic levels. As predators, they prey upon unicellular or filamentous algae, bacteria and micro-fungi. 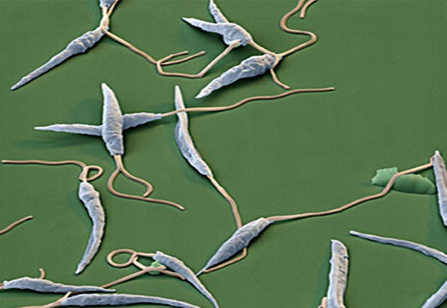 The Protozoans are responsible for the tropical diseases, which are transmitted majorly by bites of infected insects. 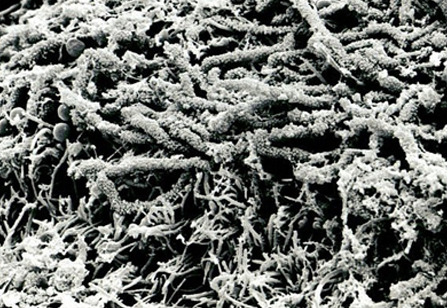 This image is of Fungus, growing naturally on the bread in a compost heap. This fungus is scientifically called ‘Aspergillus glaucus’. 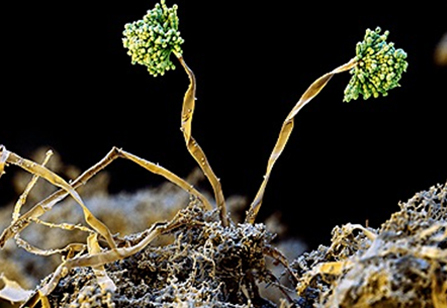 This fungus can easily dislodged by air currents or physical contact. It has multiple identities. Certain types of fungus has highly toxic and hazardous qualities, while other fungus are also used as antibiotics, medicinal, cultured food, pest control agent etc. This image is of Uranium Waste Bacteria. 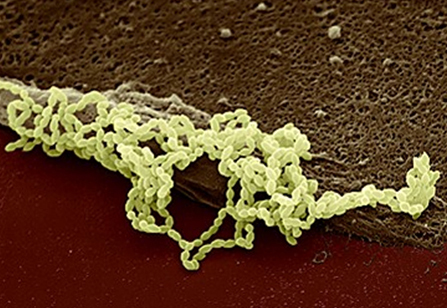 This bacterium is able to survive in radioactive environment and turn the uranium waste from a soluble form (that can contaminate water supplies) to a solid form. It can also convert waste organic matter to electricity. These are anaerobic bacteria which can survive without oxygen. Actually, it uses metals to gain energy in the same way that we use oxygen for. Diseases can be threatening. But to overcome the threat and to treat it to the core, microscope has opened the doors of solution. Let us see some of the minute components responsible for the diseases. 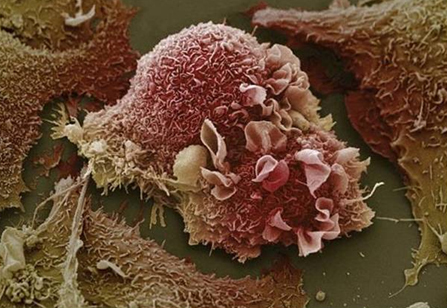 This image is of the Lung Cancer Cell. This kind of cells, tend to grow uncontrollably in the tissues of the lung. Lung cancer is the most common cause of cancer-related death in men and women. The main two types of lung cancer are: i) small cell lung carcinoma and ii) non-small cell lung carcinoma. Small cell lung carcinoma (SCLC) usually responds better to chemotherapy and radiation while non-small cell lung carcinoma (NSCLC) is sometimes treated with surgery. The most common cause of lung cancer is long-term exposure to tobacco smoke. But this is not limited upto the smokers, even nonsmokers have 15% of chances to develop the cancer on account of exposure to radon gas, asbestos, secondhand smoke and excessive air pollution along with certain genetic factors. 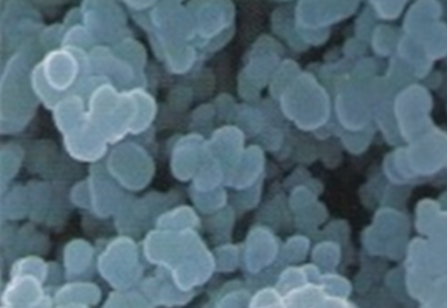 This image is of streptococcus bacteria. The term streptococcus (‘twisted berry’) refers to the bacteria’s characteristic of grouping in chains that resembles a string of beads. Human beings, pigs, cows, horses etc. are commonly the host to this organism. They mostly reside in mouth, respiratory organs, heart, muscle tissues and skin. These are actually responsible for sore throat, fever and sometimes pneumonia. Mostly antibiotic is the basic cure for the disease occurred from this kind of bacteria. Matters matter. Minerals and substances are something that this earth is made up of. Starting from breathing to every other aspect minerals and substances play its role. Let us see a few minerals and substances. This is the image of Calcium Carbonate. This substance has a widespread membership in the major substances over the globe. This is the leading component in shells, snails, pearls, eggshells of marine organisms. It is also an active ingredient in agricultural lime and principal cause of hard water. It is commonly used medicinally as a calcium supplement or as an antacid, but excessive consumption can be hazardous. It is mainly used in sealants, adhesive compound, plastic, printing ink, automobile chassis PVC anti-stone coating, vessel and container coating etc. We all know plants and vegetables are like the natural accessories over the globe. They are evidently beautiful in macro appearance but they possess the same beauty into the micro-world as well. Let us see some of them. This image is of a Seed of a Paradise Plant called ‘Strelitzia reginae’. This plant is native to South Africa and has a distinctive orange and blue flower, which resembles an exotic bird. The sunbirds sit to drink the nectar on this plant and the petals open to cover their feet in pollen. 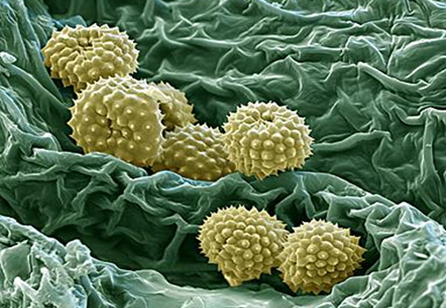 The image is of Pollen of the Common Annual Ragweed. It is the most widespread plant of the genus Ambrosia in North America. Pollen lands on a compatible pistil of flowering plants in many ways to germinate and produce a pollen tube that transfers the sperm to the ovule of a receptive ovary. 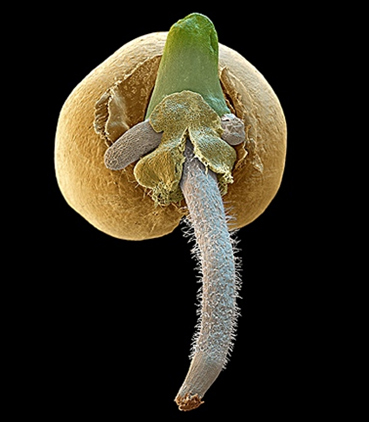 This image is of Germinating Wheat Grain. When the wheat seed starts germinating, the root radical emerges from the seed coat and begins to grow downs into the soil. Simultaneously, the leaf shoot grows to the surface of the seed and surrounds by a protective sheath. Though civilized, humans are the part of animal world. The animals around us carry the minute inquisitive beauty in themselves. We just need to witness it once. 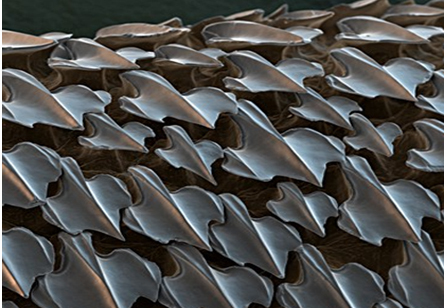 This image is of a Shark Fish Skin. These sharply pointed placoid scales are also known as ‘dermal teeth’ or ‘denticles’. They give a sandpaper feel to the shark's skin. The lower part of each scale, which anchors it into the skin, is made of bone. It disrupts the turbulence over the skin, considerably reducing the drag on its body while it swims. This design structure is quite helpful to engineers for construction of the aircraft and boat surfaces.